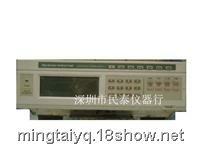 现货供应二Beckman PPS300 DC Power Supply Power Supply is capable of supplying maximum voltage at maximum current rating. Output voltage may be incremented or decremented in process steps. Up to 200 distinctive outputs may be programmed and stored in EEPROM memory within the power supply. Using the start / stop capability, up to 2000 hours of voltage fluctuations, output currents and time durations may be automatically recalled and implemented. When operated remotely, the supply can be both a listener and a talker. Using an external controller, you can instruct the supply to send measurement and status data back through the GPIB.